The news has been horrific. Many of us have seen the images and videos of the destruction in Nepal as the country shook repeatedly over the last several weeks. The wonders of an interconnected world bring the heartbreaking losses into all of our lives. Yet, I am struck by how different this disaster feels to me than the others that have come in recent times. The difference is, of course, that the people hit this time are my friends. I do not say this to take away from the many people who endured the horrors of the tsunamis in Japan or Thailand, the earthquake in Haiti, or any other natural disaster. I say this, because I hope that in sharing the stories of my friends in Nepal, you too will be touched by their humanity and help them. This is the first of many posts I will be making where I will tell the stories of my Nepali friends pertaining to the earthquakes. While it has been difficult to wake up every morning to countless messages from Nepal recounting the tragedy (13 hour time difference), it is nothing compared to the challenges that they face every day. In a country where life was difficult before, the earthquakes have taken everything from many. Suman Bhadel, a chef in the village of Changu Narayan, supports both his parents and three younger siblings. One of my friends who has asked for help is Suman. I smile every time I think about the first time I met him. I had just strolled through the temple complex in Changu Narayan, a 4-th century village in the hills outside Kathmandu, and was meeting my travel companions at the little open-air restaurant just outside the temple gate. As I was walking up the stairs leading to the elevated pavilion, I was greeted by the warm smile and boundless energy that Suman is never without. Suman explained that he would be our waiter and chef. It turns out, this 22-year old runs the entire restaurant by himself in addition to managing the small wheat, rice, and potato fields his family relies on for food. He supports his mother, father, and three younger siblings. He learned to cook while working in restaurants in India before returning home to work at the restaurant at a small guest house in Changu. Did I mention he can cook? Suman made, without a doubt, my favorite chicken dishes in Nepal. As we got to know Suman more, he invited us into the community to experience their culture like we were family. 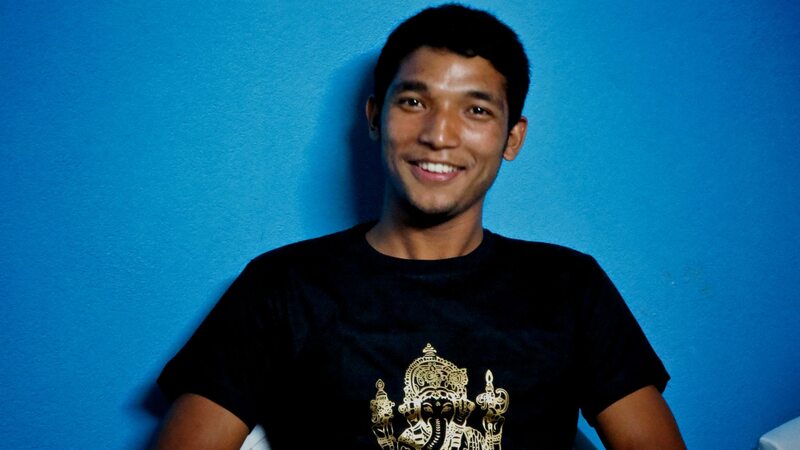 Whether he was bringing us to the evening Puja (prayer session that is mostly a musical jam session by a local family of musicians) or taking us on picnics, Suman made us feel at home. 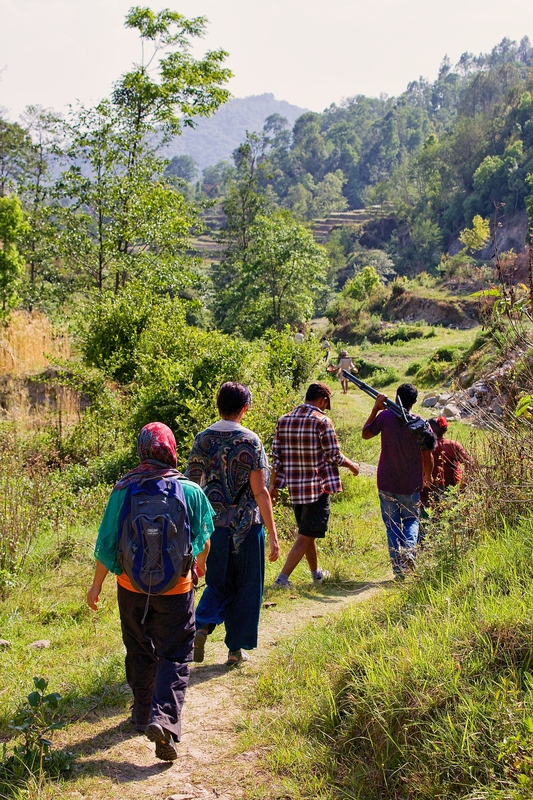 A great honor came one day when Suman invited all of us to accompany him on a 3-hour hike into the hills to attend the village’s annual festival to honor the hindu gods Ganesh and Vishnu. We were treated to a traditional ceremonial goat sacrifice that culminated in a delicious roasted goat feast. As we were walking back to Changu in the golden sunset over Kathmandu valley, we learned that we were the first visitors to attend this ceremony. 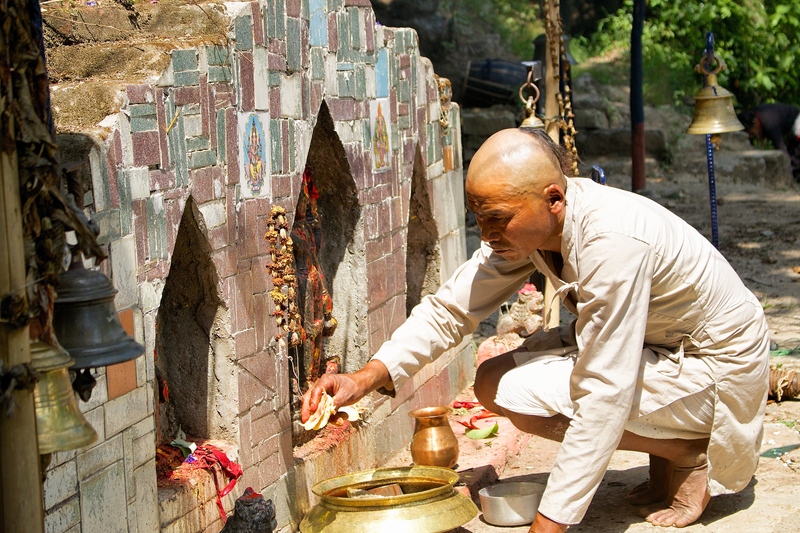 We were the first visitors to Changu to be invited to this festival, where sacrifices were made to Vishnu and Ganesh. 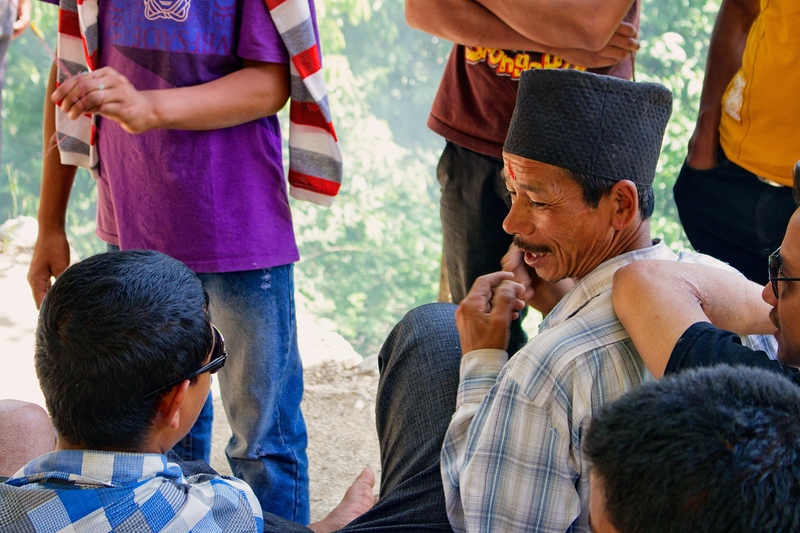 Locals from Changu Narayan await the feast after the sacrifices. A happy group with full bellies makes the 3-hour walk back to Changu Narayan after the festival. The messages I received from Suman in the days following the earthquakes were heartbreaking. Like many people in Changu Narayan, Suman and his family lost everything. His family’s home was destroyed. The restaurant he worked at is gone. He has no income, and he is the sole provider for his family. They are now sleeping under a tarp at the village’s Bus Park. Suman tells me that it would cost $3000-$5000 to build a new basic mud home for his family. Considering that his salary was about $35 per month before the earthquake eliminated his job, he has no way to pay for it. 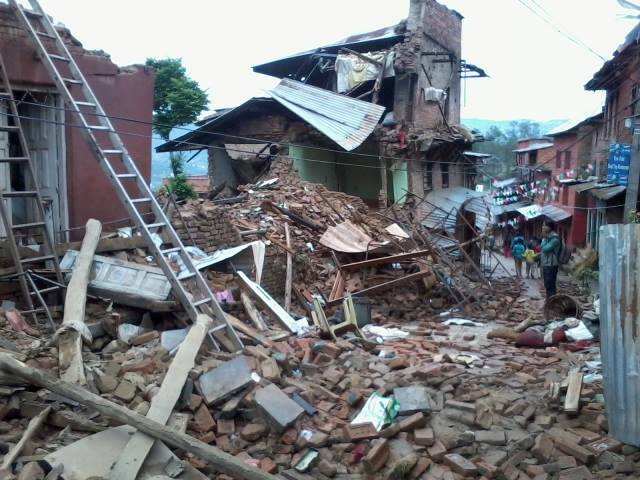 The destruction in Suman’s village, Changu Narayan, is extensive. Photo by, Balkrishna Baj. In the midst of all of this tragedy, there is a positive note. 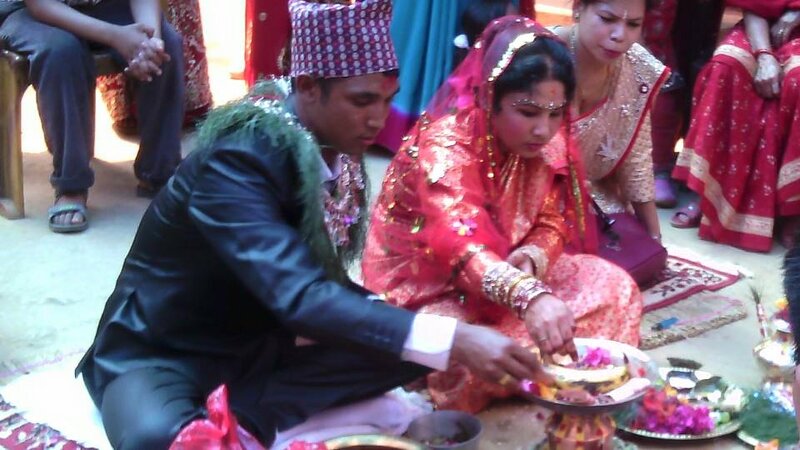 Suman just got married May 8th. Amid all of the loss and destruction, a glimmer of happiness still shines through. Suman is one of the many people in Nepal that will receive help from the donations you make to our GoFundMe fundraiser. Please contribute today.